Before getting to the spooky night, let me take you through my day in Port Arthur. If you’ve been to Tasmania before you’d know that one day isn’t exactly what you’d have in mind if you’re visiting Port Arthur. However, if a day is all you’ve got in hand, you’ve come to the right place. 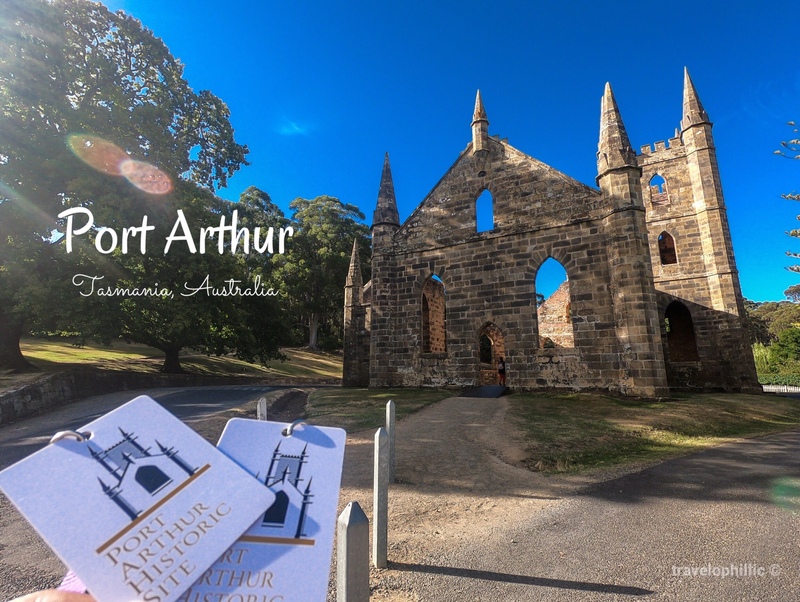 I’ve heard many travellers whine about how a week in Port Arthur wasn’t enough to see everything and I may well have been one of them if I had more time, but we just had a day and here’s how we planned it. Having left Swansea by 7.30am on our roadtrip to Port Arthur, Eaglehawk neck was on the way and was our first stop. Erosion and sea water has turned a relatively flat rock here into mosaic like pavement naturally, one of the many fascinating geological formations here. Steep rocks that end in the sea create a magnificent view. Another geological formation worth a visit is the blowhole, which is a short arch at the end of a tunnel letting the waves crash and blow out water forcefully. A well formed steep natural stone arch, that will surely blow your mind. It’s one of the 11 UNESCO world heritage listed Australian convict sites that I recommend should be a must-not-miss destination in your itinerary. This is a huge former convict settlement spread over 100 acres of land with a thousand bone chilling stories to tell. The single 40$ entry pass to this place is valid for 2 days, but you can cover it all in a day if you plan it ahead. We got here by 1130 hrs and stayed all evening. It included a 40 minute walking tour, 25 minute ferry ride, visiting the gallery to learn the stories and then you can take off on a self-guided tour with a map of the 32 points on site. Isle of the dead where all the dead bodies of the convict site was buried. These burial sites weren’t marked giving us an idea of the regard the then government had for these convicts. Many people today come here tracing their ancestors only to find a whole island of bodies beneath. I am not a believer in ghosts, but nor am I a disbeliever. I enjoy being in a limbo, having a open mind to experiences that life may bring before me. Isn’t that feeling of mysticism one of the best emotions we feel? We met a tall man with a pale face in a black cloak, holding a lantern in his hand who, to add to the eeriness, happened to be our tour guide for the night. We walked around the convict site listening to our guide narrate spooky stories not only about the haunted tales of many of these buildings but also some of the true experiences that visitors have had in these tours. Some of the buildings we walked into were the autopsy room in the basement of the then doctor’s house, solitary cells where prisoners took their own lives to escape the solitude, an abandoned church where a man was murdered with an axe, and many more. I loved the spooky experience enough to say that it was definitely one of the highlights of my trip. If you spend more days in Port Arthur you can also visit the remarks cave, and be mindful of planning your visit here when it’s low tide to be able to walk across the cave. There’s also Cape Roul, Three capes track and Shipstern Bay that need longer time here. The road from Swansea to Port Arthur has a large patch of gravel road, it takes longer than what google maps estimate, you might prefer the road from Hobart instead. Tour of Isle of the dead, Point Peur and ghost tour is not included in the entry ticket and costs are additional for each. If I had to choose one of the three I’d pick the ghost tour. Entry to all the above except Port Arthur Historic Site is free.